I am driving the new 2012 smart fortwo electric drive vehicle (smart ed) through the busy downtown streets of San Diego, America’s eighth largest city. San Diego presents itself as “America’s Finest City” with some justification. The temperature is in the sixties on this November day as ships sail in the vast harbor, towering office buildings offer dramatic views of the Pacific Ocean, and active people are in motion. This little electric car is a weapon against the growing gridlock that grinds drivers to a halt for minutes or hours in morning and evening freeway traffic. I speak from the experience of driving I-15 and I-5 to conferences or when shuttling kids for family and friends. This new approach to electric car sharing now allows people to take express buses down HOV lanes and Coaster Rail from North Country to and from work, with car2go solving the problem of traveling the last one to 3 miles to work and popular destinations. Walter Rosenkranz, a manager with car2go shows me how it works. Like any member, he displays the car2go app on his smartphone, sees the location of an available electric smart car a block away. Since this car is charging, he disconnects the Blink Level 2 charger then holds his car2go RFID card next to the car window. Walter kindly puts me behind the wheel then enters his pass code into the car2go navigation display on the dash of the car. I start the car and we take off in silence. I drive us to Balboa Park, a popular destination with its vast acres, museums, and famous San Diego zoo. We park the car, sign-off and walk away. If we were paying members, this trip would have cost us only $3 or $4. We got there in minutes without the hassle of car rental or bus transfers. Car2go is a point-to-point car sharing service. You pay 35 cents a minute. If you use lots of minutes, you’re automatically lowered to $12.99 per hour. Keep the electric car overnight and pay $65.99 per day. No surprise fees are charged for being early or late, like some other car sharing services. This point-to-point car sharing service has proven itself in Austin, Texas, with hundreds of the gasoline sipping smart fortwo. San Diego is an excellent choice for the electric car sharing, since a fast network of Blink and other level 2 chargers are being installed in public areas. SDG&E supplies the electricity using a generation mix that is 20 percent renewable, nuclear, and natural gas. There are zero coal power plants in California. San Diego already has over 1,000 drivers of Nissan LEAFs, Chevrolet Volts, Tesla Roadsters and other electric cars. San Diego Smart Grid / Electric Vehicle Report. All 300 smart fortwo electric drive vehicles are equipped with latest telematics technology, allowing fully automated, easy and convenient rental operations. It allows customers to rent the cars spontaneously without having the burden to commit to a specific return time or location. Behind the scenes car2go uses GPS and information technology to track where every car is located and their state-of-charge (SOC). Members can report everything from driving problems to dirty interiors through the car2go navi system or with an email or call. A maintenance team is put in place to clean cars. Customer service telephone support is available. At times bunches of cars will need to be relocated. For example, a growing number of cars could accumulate at a destination like Sea World and need to be moved to a popular pick-up point such as a train or transit center. I look for a steep hill. The smart ED reaches 25 mph in one block, convincing me that it has the power for its San Diego service area. The version 2 drive system is an improvement over version 1. It does not have the power of a Nissan LEAF, Chevrolet Volt or Mitsubishi i. I am not convinced this EV can handle the steepest hills of North Vancouver where car2go uses the more powerful gasoline smart fortwo. Next Spring, however, version 3 of the smart ed will have a drive system as powerful as the Mitsubishi i. The smart fortwo electric drive vehicle is a two-seat city car. Only 8 feet long, it can fit in parking spaces that other cars cannot, a most useful feature in cities. The electric car looks just like its gasoline cousin the smart fortwo. The first generation of this smart ed was underpowered for hills with an electric motor with only a third the power of competitor Mitsubishi i. The version-two car, which is being put into daily car share and fleet use, has doubled the power of the electric motor. Version 3 will be the smart electric that becomes available in a year or two for individuals to buy or lease through dealers. That smart ed will out power the Mitsubishi I with a 55kW EM-motive electric motor, a joint venture of Daimler and Bosch. The vehicle will have 16kW of lithium battery pack, up from the 14kW in the car that I’m driving. Daimler is the parent company of Car2go. In the U.S. we best know Daimler for its Mercedes cars. Daimler also owns smart. Although most individuals and fleets own cars, a growing number lease, rent, or simply use a car as an on-demand service. Car sharing has about one million members in the U.S. and the numbers are growing to include many who also own cars. Daimler is ahead of the curve to expand into car sharing. 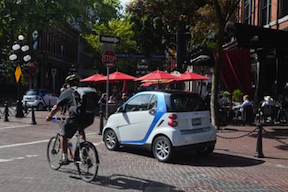 Car2go started in Austin, Texas, with 200 smart fortwo gasoline cars in this useful point-to-point model. The car2go program is already very successful in the German cities of Ulm and Hamburg, and the Canadian city of Vancouver. More than 45,000 members have used the 1,100 car2go more than 900,000 times. The average duration of a car2go rental is between 15 and 60 minutes and the average range lies between 5 and 10 kilometers. Its first two cities for electric car sharing are San Diego and Amsterdam, each opening in November 2011 with 300 electric cars each. Both cities currently have networks of hundreds of electric car charging points. By the end of 2012, each city will have over 1,000 charge points. Expansion to at least 40 additional European cities will include a joint venture between Europocar and car2go. The innovative electric car share program gives car2go competitive advantage, but it does face formidable competition. The giant in car sharing is Zipcar that is testing a few electric cars from San Francisco to Philadelphia. Rental car giant Enterprise has 150 electric cars now available for rental. Many customers will prefer the Nissan LEAFs and Chevrolet Volts that are offered. By the end of 2012, Enterprise expects to be renting at least 1,000 electric cars including business programs for fleets and large multi-tenant complexes. Enterprise has expanded into car sharing with WeCar. Enterprise has a vast fleet of cars that can be rented in one location and left at another. Hertz also has Nissan LEAF rental pilots and has also entered the car sharing business with Hertz On Demand. There is a friendly competition between German headquartered Daimler and French headquartered Autolib. Paris is trying 66 electric city cars in a point-to-point Autolib Blue Cars in a point-to-point car share program. The goal is to have 3,000 of these electric city cars available in Paris by the end of 2012 expanding on 20,000 Velib shared bicycle program now successful in the City of Light. The race is on to provide us with more convenient choices as we navigate our busy lives. With smart phones and smart apps we can make our best choices during the day of using transit, driving our own cars solo when necessary, and using electric car share to start at one point and finish at another.